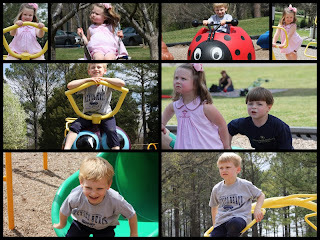 shelly's summary: Big Park Fun! this picture pretty much sums it up... JP "accidentally" fell into the creek... when will he learn that mommy and daddy really do know what they are talking about... rocks ARE slippery! Thank goodness for baseball clothes in the car. We enjoyed the park and highly recommend it to all our friends... we also had a surprise play buddy... our buddy J and his family were there too.